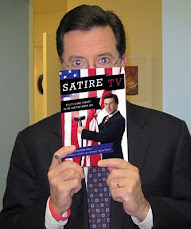 Here, and moving forward, I want to think about what sitcoms can do to make comedy on television more responsive to our desperate need at the moment for more informed social dialogue. 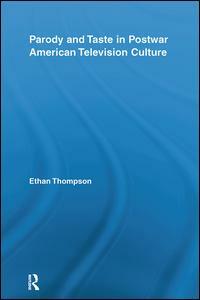 I want us to re-embrace the notion of TV as a cultural forum, and in particular, the role of the sitcom in that forum. I’d like to get away from focusing on stylistic or structural differences in sitcoms, or even their current trends of self-reflexivity and instead focus (or re-focus) on what are the enduring pleasures of the sitcom, and considering how those pleasures might hold promise for articulating and negotiating cultural conflict. 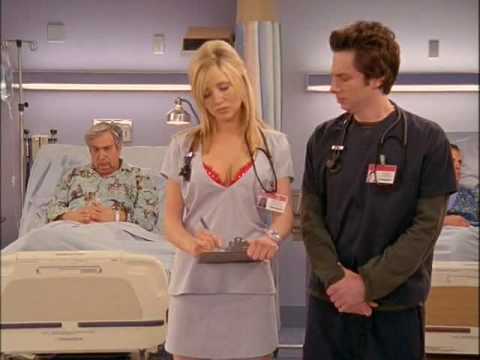 Maybe, as the title of an upcoming Flow Conference panel I will be on suggests, “The Sitcoms Have Become Self-Aware.” But it’s what makes the shows “sitcoms” and not what makes them “self-aware” that I’m interested in. There is also evidence for audience taste for traditional sitcom pleasures. On the one hand, there is the continued success of sitcoms that academic and journalist-critics shun, but which Nielsen ratings suggest audiences love, such as How I Met Your Mother and Two and a Half Men. Then there is the very fact that critics are so vocal about shunning these shows and wishing there were “better” sitcoms more suited to their tastes and nostalgia. Sitcom nostalgia extends to general TV audiences as well. Besides the strip programming of syndicated sitcoms such as those just mentioned, and relics like The Fresh Prince of Bel-Air, I am recognizing among my students a growing trend of binging on DVDs of 1980s and 1990s sitcoms such as The Facts of Life and Full House, and brandishing knowledge of those texts and the ways in which they dealt with conflict as hip cultural capital. Maybe LOST will enjoy a longer life of binge viewing, but my students stare blankly at me when I talk about doing so with 24. Having done so with The Facts of Life, however, brings approving ooohs and aaahs. Personally, my own sitcom nostalgia has got me watching episode after episode of The Bob Newhart Show and The Mary Tyler Moore Show on Hulu. 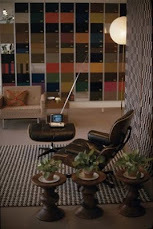 I have to admit that it’s sort of like what Mad Men does for me in drama: the production design (really the fashion and décor) provides me the necessary aesthetic distance with which I can enjoy all manner of self-destruction and over-indulgence. Without it, I might as well watch that douchebag Scott on Kourtney and Khloe Take Miami. Watching those early 1970s shows is similar. They are so awesomely dated in their fashion and reliance upon the proscenium that I can enjoy the popular pleasures of complication and resolution the traditional sitcom so efficiently provides. We can look at a show like Modern Family to see what the format allows a sitcom to do aside from the traditional complication, confusion, alleviation structure. Besides the annoyingly exaggerated handheld camera, Modern Family uses the verite format to produce humor that deviates from linear narrative in ways conducive to more aggressively articulating cultural critique. The couch segments, in which individual characters or couples speak to the camera about their familial experiences, provide opportunities to cutaway to past comic episodes, at the same time they reiterate the persistence of the family, since they suggest that outside the immediate episode, the family persists, prevails, and can be positively reflected upon in order to teach us something. Besides these specific segments, the verite design of the program suggests it has been rapidly edited, which in turn encourages the sort of non sequitur jokes and ironic moments we’ve become accustomed to in other kinds of comic programming. One other benefit of fitting traditional sitcom-style jokes into the verite format is that when something is said it doesn’t have to succeed at being funny, because there is no audience to respond with laughter, or no laugh track to suggest that an audience would have. A line doesn’t have to succeed at being funny; it can just be ironic, or poignant, or just a line. Recognizing how nicely Modern Family fits the typical complication/confusion/alleviation (through family) model of the domestic sitcom described by Newcomb should help us recognize that the characters are characters again in the model of the domestic sitcom who fill specific familial roles and whom audiences can empathize with, rather than discursive figures who critique cultural stereotypes. While some have suggested that the show satirizes both modern families and sitcom constructions of families, I don’t see this at all. For example, the fact that the more “flamboyant-gay” character, Cameron, was once a college football player doesn’t undermine homophobic stereotypes; it throws his “gayness” in greater comic relief, allows him to identify with his partner Mitchell’s father more, and further highlights Mitchell’s failures at traditional masculinity. In short, even Cameron loves football! And isn’t that funny! I cringe during most scenes with Gloria; she seems employed as both a fiery Latina stereotype and an only slightly less emasculating Peg to Ed O’Neill’s Jay/Al Bundy. 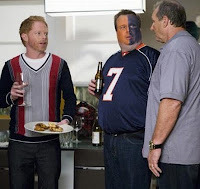 Watch an episode of Modern Family and imagine how easily it could be transformed into a “filmed before a live studio-audience” sitcom with only the addition of some sound effects. Better yet, watch this clip where I have done it for you. Modern Family (Old School Version) from ethan thompson on Vimeo. Given continued popularity of sitcoms, the abundance of “sitcom nostalgia,” and the embrace of the neo-traditional domestic sitcom Modern Family, I think it’s time to 1) reiterate how we define the sitcom by describing its narrative structure in ways that accommodate recent innovations in modes of production, performance, and visual style and 2) consider how that narrative structure can take advantage of such innovations to more aggressively mediate culture, articulating controversy more routinely, if less narratively framed, than it has in the past. The latest edition of Newcomb’s TV: The Critical View doesn’t include the cultural forum essay, but I believe that the continued show of love for the sitcom, nostalgic and otherwise, suggests that the ritual of TV watching is still important, regardless whether it is done online, on-demand, time- and format-shifted, etc., and that the sitcom still holds a privileged place in television culture. Here is my recurring anecdotal evidence for this: if I casually talk about sitcoms with non-academic acquaintances, I don’t receive the immediate and obligatory revulsion that I get when talking about reality TV. (Mind you, if I talk about specific reality programs, I’m less likely to get that reaction.) General reaction: Reality = Uhg; Sitcom = Ahh. What I do hope we can abandon from the critically-informed past is the notion that the sitcom is an essentially conservative format. The cultural forum argument ought to have pushed us past that—it’s more important what is discussed than how things end, or how we feel about the theatrical characters saying things. What I want to think about is how the sitcom format could now be pushed (thanks to narrowcasting, pay cable, YouTube, et al.) to articulate pressing political issues in a way that counters the likes of Glenn Beck and Sarah Palin. 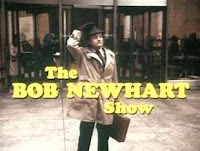 Those two pop culture creations have been granted powers to “connect the dots” between real public discontent and alienation with conspiracies and right-wing flights of fancy less bounded by rationality than the most outlandish fantastic sitcom from the 1960s. Is it unreasonable to ask a sitcom (particularly one that purports to be “modern”) to do better in 22 minutes? Given the damage that Glenn Beck can do in two, I don’t think so. Whatever happened to TV as furniture? 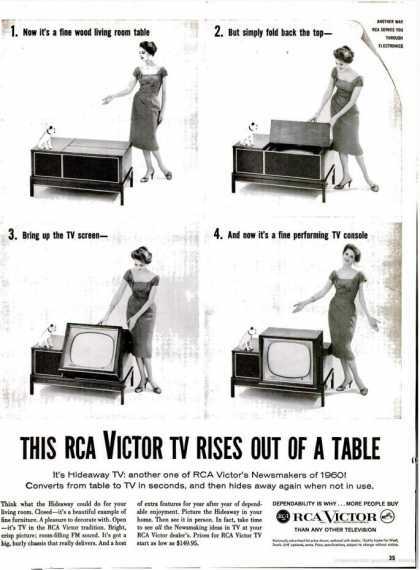 Spend any time looking at old TV ads from the 50s, and it's clear a lot more thought used to be put into how a TV "fit" into a home's decor than nowadays. Sets routinely were advertised with various styles of cabinets--colonial, modern, etc.--all the better to fit the home. 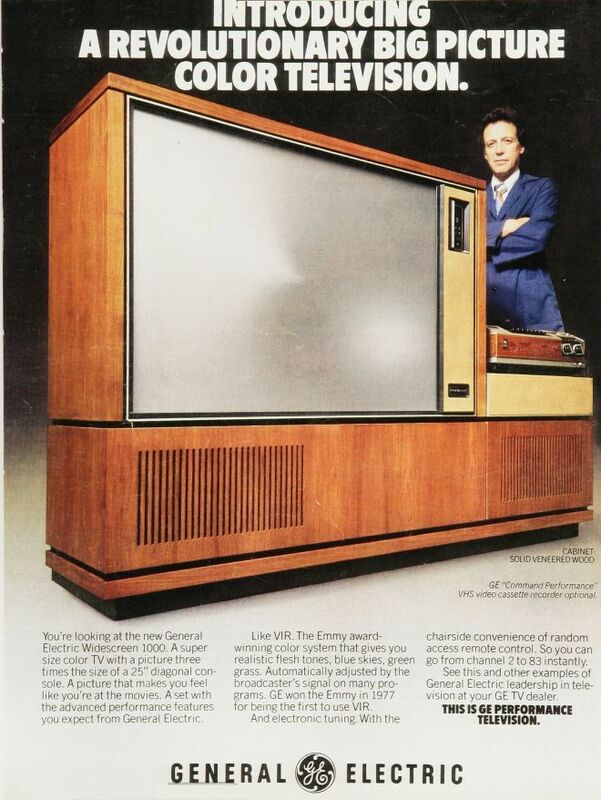 This ad goes a step further, suggesting the TV could be folded away into a normal piece of furniture. 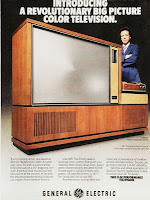 Of course, this is just a cousin to the old console TVs included a turntable, speakers, vacuum tubes, etc. and had to be a good looking piece of furniture as they were bound to dominant any room. With only a few minor bleeps in the last 50 years, TV design has pretty much been all about the "ers"--bigger, flatter, thinner, higher def-er. Why hasn't anyone done what Apple did for the PC, first in the 80s and then at the end of the 90s with the iMac, giving us a TV as design fetish object? How come the only sweet looking TV in the last 40 years has been the JVC videosphere, which might look cool on my office shelf (if I could find one on eBay), but I'm pretty sure won't hook up to my DirecTV box? Instead, I am presented with the tantalizing option of hanging my TV on the wall, as if this has always been the fantasy of how TV should fit in a room, rendering it part of the architecture as much as decor. Of course, that's nonsense. TVs are, by definition, meant to be seen. I'm sure we all know someone who keeps a TV in a cabinet, behind a screen, or in an armoire. But aren't the doors always open? With so many corporate TV death rays set on mobile TV, there is also the other trend of TVs getting smaller. Maybe this will lead to putting them in interesting cases, which will mysteriously remain immobile. Since I'm no industrial designer, here are my specific instructions: I want a new HD Videosphere and I want it to have built in Wifi so I can connect to Hulu and Netflix. I'll stick it next to my bed, on a side table. That seems straight forward enough. Can I really be the only one?